The MAXRFL2KIT is a high performance radial flow GAC system. Utilizing a coconut shell greencarbon technology, this system delivers exceptionally low pressure drop while maintaining a 25 micron efficiency for the best chlorine taste & odor reduction. 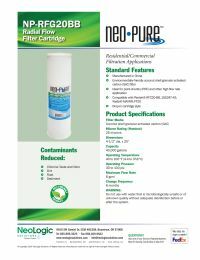 System includes a 25 mic Radial Flow GAC 20" BB filter cartridge, a 5 mic Dual Gradient Polypropylene Sediment Filter, two 20" Heavy Duty Housing 1" with pressure relief button, mounting bracket with mounting screws, and a Heavy Duty Filter Housing Wrench.